THE BOXER UPRISING 1899 – 1900. The background and events leading to the actual Boxer Uprising during the critical months of May to August 1900. Before proceeding to describe the series of military events that culminated in the relief of the Foreign Legations in Peking and the occupation of the capital of China by the contingents of the Allied Powers, it may be of interest to discuss the background of the Boxer movement. The real origin of the I-ho-ch’uan, or ‘Fists of Patriotic Union’, commonly known as the ‘Boxers’, is difficult to trace, one argument is that it was the outcome of the cession of Kiao-chou to the Germans, and had for its object the defence of the province of Shan-tung against the invasion of the foreigners, others maintain that it is really an old society, which the general state of unrest had brought to life again. Whatever its origin, it is now a matter of history that the obscure society, which in the beginning might have been easily suppressed, grew rapidly into a vast and dangerous association of brigands, which the Government soon found beyond its powers to control. During many centuries the Chinese empire has been a hotbed of secret societies, of which some were political and anti-dynastic, whilst others are of a more harmless nature, and were originally founded with the object of mutual protection of their members either against the illegal exactions of unjust officials or the depredations of robber bands. One of the oldest societies the Ko-lao-hui ‘Elder Brother’ society was initially founded for mutual protection of its members, an offshoot of the parent society is the Ta-tao-hui ‘Big Knife’ society, which has its head-quarters in Ho-nan, and was said to be violently anti-foreign, and especially anti-Catholic. Foreigners through the Boxer society. The Boxers rapidly increased in numbers, and with the objective of pleasing the people, the Boxers declared their aim to be the destruction of the Roman Catholic priests and converts, and their first attack in 1899 was upon a Roman Catholic chapel at Li-lien-yuan, in Shan-tung, where a temple had formerly stood which had been purchased by the Catholics and replaced by a chapel. Attacks by the Boxers were directed against the Catholic converts, many of whom had their houses burnt down and their possessions confiscated. The violence grew, and very soon the Protestant converts shared the same fate as the Catholics; houses burnt and possessions confiscated, while a few were killed, all were ‘secondary devils’ and only less obnoxious than the pure foreigner. At first the Boxers confined their operations to Shan-tung, but towards the end of 1899 they spread into the southern part of Chi-li, where the persecution of the Christians also commenced. The foreign Ministers and missionaries had for some time been watching the growth of the Boxer society with some anxiety, when the news reached Peking that an English missionary, Mr. Brooks, had been murdered. The British Minister at once demanded the execution of the murderers, the punishment of the officials concerned and the suppression of the Boxer society, in return the Chinese Government decreed that the two men who actually committed the murder were beheaded; some of the lesser officials were reprimanded; and Yu-hsien, ex-Governor of Shan-tung and head patron of the Boxers, was ordered to Peking, having been succeeded in office by General Yuan Shih-k’ai. In Peking Yu-hsien was received with honour by the Empress-Dowager, and shortly afterwards, being appointed to the Governorship of the neighbouring province of Shan-hsi, where he had ample opportunity of fostering the Boxer movement. An edict was published ordering the suppression of seditious societies, but pointing out that all societies were not harmful. In fact, the whole decree was so worded as to exonerate the Boxers from blame and encourage them to persevere. The Viceroy of Chi-li, Yu-lu, had recognised the necessity of keeping the Boxers in check, but on the 22nd May 1900, a party of his cavalry was ambushed at Lai-shui and destroyed. Fresh reports were constantly arriving of attacks on Chinese Christians, and the London Mission chapel at Kung-tsun, 40 miles southwest of Peking, was destroyed. On the 19th May 1900, Pere Favier, the Roman Catholic Bishop of Peking, whose experience of the Chinese is unrivalled, and whose sources of information through the Roman Catholic converts are very extensive, reported to the French Minister that he considered the situation to be extremely serious. In the district of Pao-ting-fu numerous Christians had been murdered, and the persecution of converts was daily drawing nearer to Peking. This new movement was aimed against all Europeans, and not only against the foreign religion, as was clearly stated by the Boxer society. Père Favier further stated that the rising would spread to Peking, where first the churches and then the Legations would be attacked. The city was full of anti-foreign placards and with everyday more were appearing. In fact, the movement was very similar to that of Tien-tsin in 1870 when the same form of threats existed and the same warning were given and disregarded, with most disastrous results. Pere Favier also asked for guards to be sent to protect the Pei-t’ang cathedral, which is the Roman Catholic headquarters in Peking. This warning was communicated by M. Pichon to his colleagues, this information from such a source, was not to be disregarded. The Foreign Ministers accordingly addressed another strong note to the Tsung-li Yamen demanding the suppression of the Boxers and the restoration of order. The Tsung-li Yamen claimed to be taking all means within their power to suppress the rising, and assured the Foreign Ministers that the safety of the Legations would be paramount and in the special care of the Chinese Government, who regarded the Boxers as rebels and outlaws. Whilst the Tsung-li Yamen was giving these assurances to the foreign Ministers, the Manchu party, notably Kang-yi, was doing all in its power to encourage the Boxers and assure them of the favour of the Empress Dowager. On the 28th May 1900 the Boxers burnt Feng-tai railway station, and tore up part of the line, which however, was quickly repaired. The Foreign Ministers now considered that the situation in Peking had become critical and telegraphed to Tien-tsin for armed guards for the Legations. These were despatched immediately and 337 men, reached the capital without opposition on the 31st May 1900. At the same time the Boxers had also begun to destroy the railway at Pao-ting-fu, with all of the European railway employees leaving on the 29th May by river for Tien-tsin. They were, however, pursued and attacked by Boxers, and four of their members were killed. On the 1st June 1900 two English missionaries, Messrs. Robinson and Norman, were attacked at Yung-ch’ing-hsien just 40 miles south of Peking. The Church of England Mission was burnt and Mr. Robinson was pursued and at once cut down, but Mr. Norman, having been taken prisoner, was not murdered till the following day, having in the meantime been subjected to the most inhuman tortures. 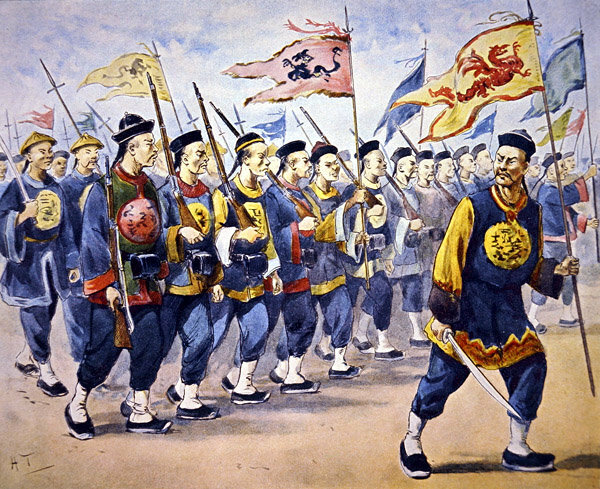 In the meanwhile Tung Fu-hsiang’s Kan-su troops, who were wild, undisciplined, anti-foreign Mohammedans, who had been taken from the neighbourhood of Peking at the instance of the Foreign Ministers during the winter of 1898-99, were ordered back to the capital and immediately supported the Boxers. On the 7th June 1900 General Nieh’s troops, who had been protecting the railway line from Tien-tsin to Peking, were ordered to return to their camps at Lu-tai, but they remained in the neighbourhood of Yangtsun for several days. All communication between the Legations and the outside world was by this time cut off, and the Boxers were soon openly drilling in Peking itself. 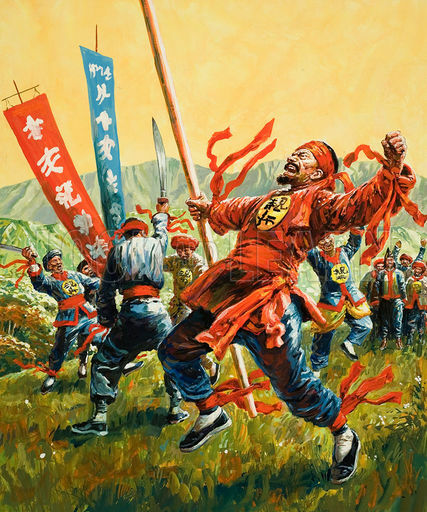 During the 9th June, Tung Fu-hsiang’s troops entered the capital and with them came hoards of Boxers, who, openly in the uniform of their society, and armed with swords and spears, boldly paraded the streets, declaring that their mission was to exterminate the foreigners. Sir Claude MacDonald the British Minister in Peking wired Admiral Seymour at Taku and requested that he advance on Peking. On the 11th June the Japanese Chancellor, Mr. Sugiyama, was murdered by Tung Fu-hsiang’s troops, whilst on his way to the railway station to greet the expected Seymour relief column, at the Yung-ting man, or south gate of the Chinese city. A tardy decree was published the following day to the effect that the Empress Dowager was grieved at the occurrence, which was the work of outlaws, though it was well known throughout Peking to have been done by regular troops. On the 13th June the Boxers first attacked the Legations, and on the same day commenced with their massacre of Chinese Christians. By the 16th June 1900 all foreigners and Chinese converts to Christianity in Peking were either in the Legation Quarters or in the Catholic Cathedral Pei-t’ang. On this same day the Boxers set fire to a large area of the Chinese city of Peking, see map of Peking – Figure 1, that housed shops and firms that dealt with foreigners, this fire destroyed over 4,000 businesses. Now on the 19th June the Foreign Ministers received an ultimatum from the Tsung-li Yamen stating that all foreigners had to leave Peking within 24 hours or their safety could no longer be guaranteed. Safe transit to Tien-tsin was offered to all foreigners who were ready to move on the morning of the 20th June.